As a member of the social media team for a large health care network, one member of our group asked the poignant question about how to measure success in social media. Measuring social media ROI in an intensely regulated industry that is designed to keep data locked away is not simple task. First and foremost, in healthcare it is a difficult thing to measure a direct conversion from your online initiative to patient status. And in a not-for-profit environment the goals of health care aren’t directly tied to profit margins at all. Yet, we’ve all heard the phrase “without a margin there is no mission.” There are many areas of healthcare that can contribute to a margin, some of which include direct patient treatment, clinical trials, referrals, home healthcare, etc. Early in our social media discussions on a conference call regarding the development of social media guidelines, a small workgroup on the issue came to the conclusion that measuring ROI really depends on your goal, and in turn what a response looks like from your target audience. Knowing those two critical pieces of information will play a key role in helping you define your success. Measuring direct ROI is a little tougher than in other sales-related endeavors in other industries because the source of the sale may be the Twitter follower’s physician referral of which you may never be aware. So try to measure your ROI by working from your facility’s strategic objectives down to the tactical measures you employ to get there, and this is where you determine your audience as well. Then at regular intervals look holistically at your progress using measurable data points. If indeed a goal is to increase margins in some way, then you have to define what a conversion looks like for that target audience for that goal. If it’s physicians referring patients, maybe you measure ROI on how many physicians follow your Twitter posts. If you’re trying to stand out in your market with a new leading edge medical device, such as a Cyber Knife, maybe the measure of success is how many members of the community respond to a Facebook event that showcases the device at an open house. Maybe you measure ROI more indirectly by measuring how many “conversations” are taking place on your social media sites. Essentially though, to coin a worn out phrase from LA Fitness, “what gets measured gets improved.” So whatever your goal is, you need real data to be able to measure your return on investment. My final point is that social media alone is not Nirvana. You must combine this medium with traditional efforts you do at your facilities all the time. Find a creative way to marry social media with important initiatives like community education, patient satisfaction, physician recruitment and any other activity that does not violate patient privacy to further your goals. I love those Mac commercials. I really do, but I never really thought seriously about switching to Mac. I put up with the degrading performance over time of my PCs, I was even okay with the occasional rebuild – from scratch – just to get a fresh start. The cost of two days of productivity was always well worth the investment in gained productivity by not having to reboot a few times a day. No. I never really took the Mac commercials seriously because we develop applications at my company. We can can work with Photoshop or Illustrator with the best of them, but our talents at DirectClarity lie in content management and web applications, so nah, we’ll stick with PC because “we develop applications”. Hmm. My image was shattered. These were geeks of the highest order. Carrying Macs. Mental note to self. Upon my return to Phoenix I continued along my PC ways until just before a big WebEx with a team of hospital corporate big wigs my PC froze and left me to explain why we had “technical difficulties” in presenting our information. That was it. Fed up with PC, I found a great deal on a MacBook Pro, loaded Snow Leopard, added my Exchange Server with no issues at all, and installed VMware and then Windows XP on top of it. Never has a Microsoft product run so smoothly with so few errors. My Mac just works. That’s all I expect (too bad my PC doesn’t understand that little job requirement). After researching antenna mounting options for the last couple of weeks, I’ve come up with a hybrid design of sorts. It will incorporate features of ridgemount and tilt-over designs, and will additionally employ guying for stability. Aside from the goal of performing well, my secondary requirements are that it causes as little destruction to the roof as possible, and that it not be immediately visible from the main road or the front yard. I’m going with the tilt-over design (it will employ a winch for raising and lowering the mast) because I want easy access to the antenna if I need to make changes. I’d also like to be able to raise and lower the mast without needing anyone else on site to assist. 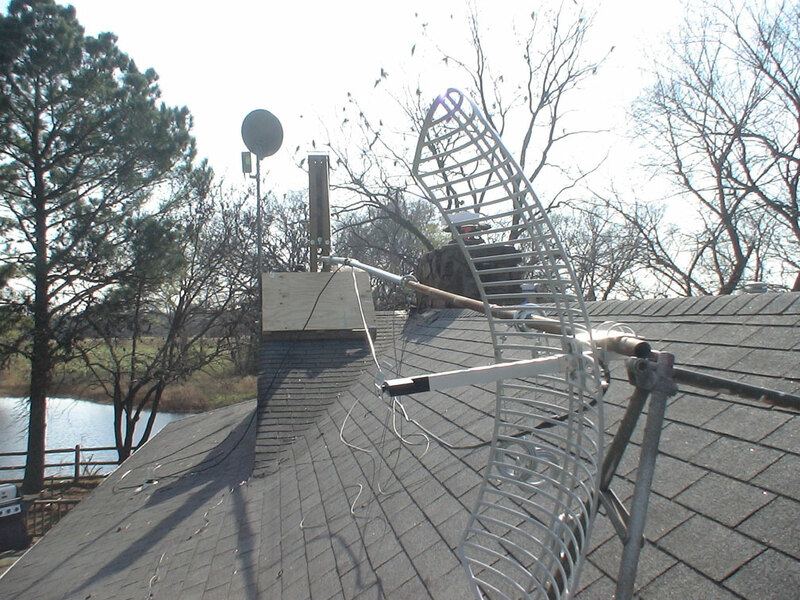 The ridgemount feature will let me take the advantage of starting my tilt-over at a base height of 18 feet by mounting on the peak of the roof. 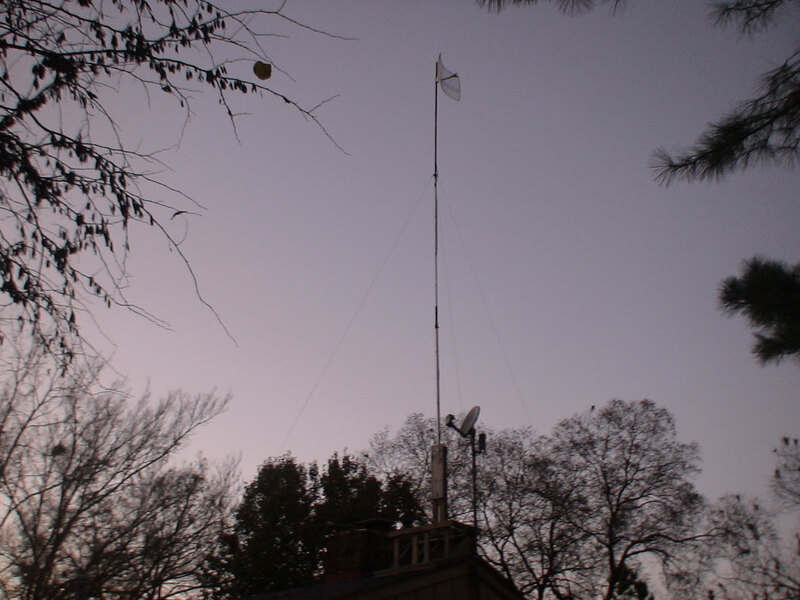 That’s more than a third of the way to my goal, which is to have the antenna sit at, or higher than, 50 feet. Although I won’t have LOS (line-of-sight) to my target at this distance, getting above the average tree-line altitude will remove as many obstacles from the signal path as possible. 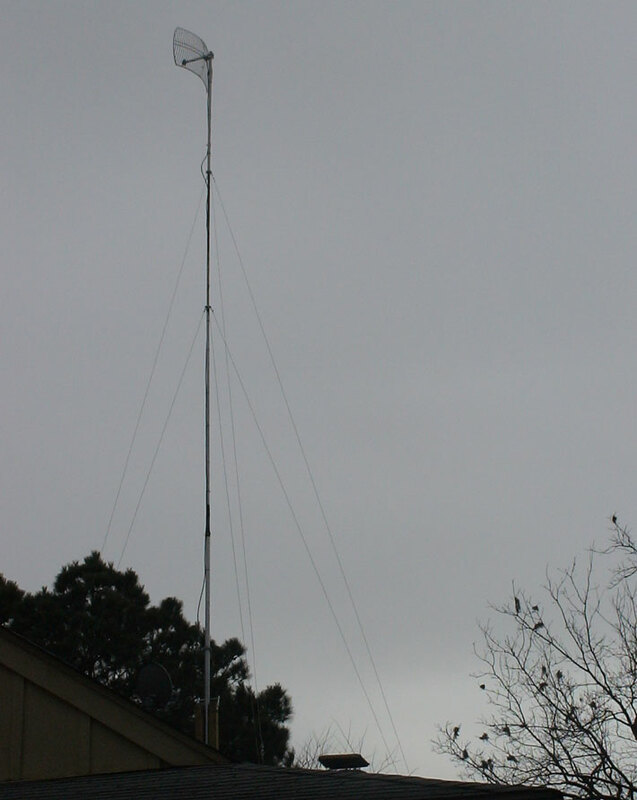 besides, I have a lot better chance of finding a usable signal at 50 feet than I do at 20 or 30. Before I grabbed my materials and headed for the roofline I decided to check the temperature. I guess it could be worse- it could be humid but fortunately it is not- still, the thermometer is reading about 86 and it’s only 10 AM. Have you ever experienced what it feels like to work on top of a roof with the shingles pouring off heat from the sun? Good times. Here’s where the antenna will be mounted. I’ve picked a spot just behind the satellite dish because it offers a slightly lower tree-line to the north than at any other spot on the roof, plus that location will leave the bulk of the mount invisible from the main road and the front yard. I kicked this part of the project off by determining the pitch angle of the peak so I can construct a sturdy base. Since this project is low buck I didn’t use anything facy. Just a piece of paper and sharpie marker that I traced the angles with. When I was done it looked like a drawing of the Flux Capacitor. You movie buffs won’t have to click the link to appreciate that one. Using a couple pieces of scrap wood, I cut the angles with my trusty Black-n-Decker chop saw and did a test fitting. I had to modify the angles just a bit, and keep cutting and fitting until I had it right. it only took a couple of tries. Once I had the correct angles, building the base was a piece of cake. Now for the fun part. On each side of the peak. just a few inches before the angle cuts join, I’m going to fit a couple pieces of 2×12’s and angle them up until they sit perfectly level. These two pieces will form a 12″ rectangular hole that our 4×4 uprights will drop into. These 4×4 uprights (which will be 6 feet long) will provide the pivot point and lower anchoring point for our mast. (Note the short 4×4’s at each end of the base. These are extra pieces that I used to initially position the 2×12’s, and they will stay there to provide extra support although when we’re done they will not be visible). Notice the orange level on top of one of the supporting 4×4’s? You have to constantly check for level all the way through a project. It’s a good rule of thumb to assume that every action you take will knock things out-of-level. Since the main 4×4 uprights will anchor to the supporting 4×4’s, it stands to reason that if they are level and plumb, so will the main uprights. My son James starting getting interested at this point and came up to help. To further bulk up the base, we’ll add more (shorter) 4×4’s to the bottom of the base running perpindicular to the main uprights. All of this framing will be hidden once we “skin” the top with a couple of pieces of 2X6, which will add even more structural strength. 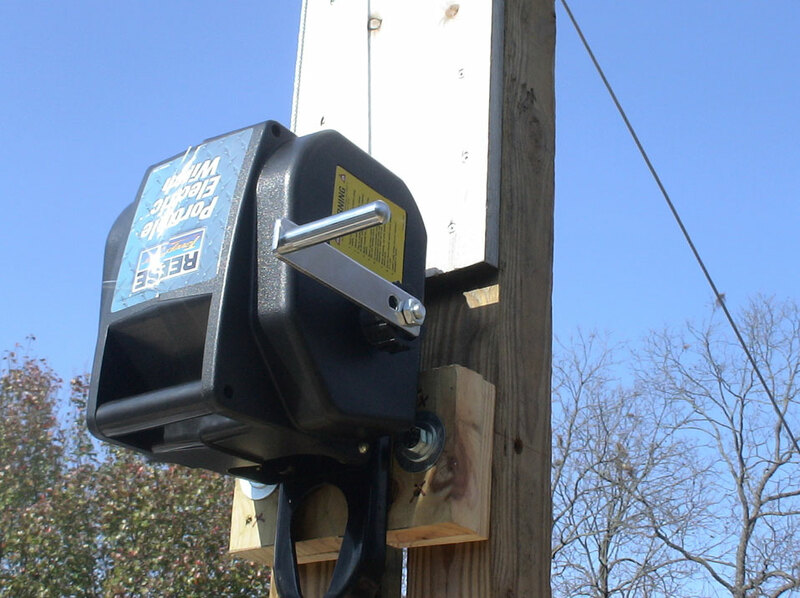 At this point I’ve got the main 4x4x6′ uprights in place, and after going through my second battery on the cordless driver and about 100 3″ gold screws connecting everything together, those uprights are so secure I could probably climb them and sit on top. Down in the base there are a total of 6 4×4’s interconnected with the 2×12 sides for stability. At this point there are no entries into the roof. Everything is self supporting, which is exactly what we wanted. Now lets check for level again! Checking the main uprights for level - Level is good! Almost done for the day. To finish, we’ll skin around the tops of the supporting 4×4’s to hide the framing and to make it all a little bit stronger. This will hide the first foot and a half of the uprights, and bring our mast starting altitude to 18 feet. I also closed the “top” parts of the rectangular hole around the uprights. We’ll seal those up with silicone and then Thompson’s Waterseal the whole base to keep out the elements, but that will happen later. Here’s a shot of the base before I skinned the top to hide the shorter 4×4 supports. The uprights aren't crooked - I wobbled the camera. Next weekend, before we mount the mast, we’ll add some framing on each side of the 2×12 supports to hold some plywood that we’ll slope down to cover the open distance between the front of the ridgemount and the top of the upright supports. With that in place we’ll add tar-paper, and then I’ll shingle it (the previous homeowner left boxes and boxes of shingles) so from the ground or the air it will resemble a section of pitched roof. My wife and I own a getaway house we are renovating on a 5 acre plot of gorgeous, mother-nature decorated, out-of-the-way land. I could seriously see myself retiring here 20 years down the road, but right now I’m on a mission. You see, the techie in me just can’t quite reconcile the lack of Broadband Internet access with the On-Golden-Pond beauty of the place. I figure I spend about 60 to 70 hours a week coming up with software solutions to all kinds of business challenges, so why should this be any different? Enter Wireless Mobile Broadband. Simply put, it’s using existing cellular networks to provide Internet access to all those folks on the go. What you may not know is that the user experience is getting good enough now to seriously consider using it as a fixed location Internet solution. Without boring you to tears, lets just say there are 3 basic levels, or tiers, of connection speed. At this stage of the technology, there is a direct relationship between speed and civilization. Heavily populated metro areas are more likely to have the faster tiers, while those of us out in the sticks (that would be me) have to settle for, well, what we can settle for. Since I’m the kind of guy that hears “not yet” instead of “can’t be done” I suppose this project was inevitable. About 45 days ago I bit the bullet and retired the ISDN line. I had it for two years and it provided a constant-on connection that was about 3 times faster than dialup. Enough speed to bear the Internet, but just barely. In it’s place I have a Sierra Wireless 885 Compass (also known as a Mercury LaptopConnect on AT&T Networks). There’s a cell tower about 3 miles due East of the house, and I have no problem keeping a very solid connection. It never drops, and most of the time I maintain a full 5-bars of connection strength. The 885 is a USB solution that plugs right into any laptop. 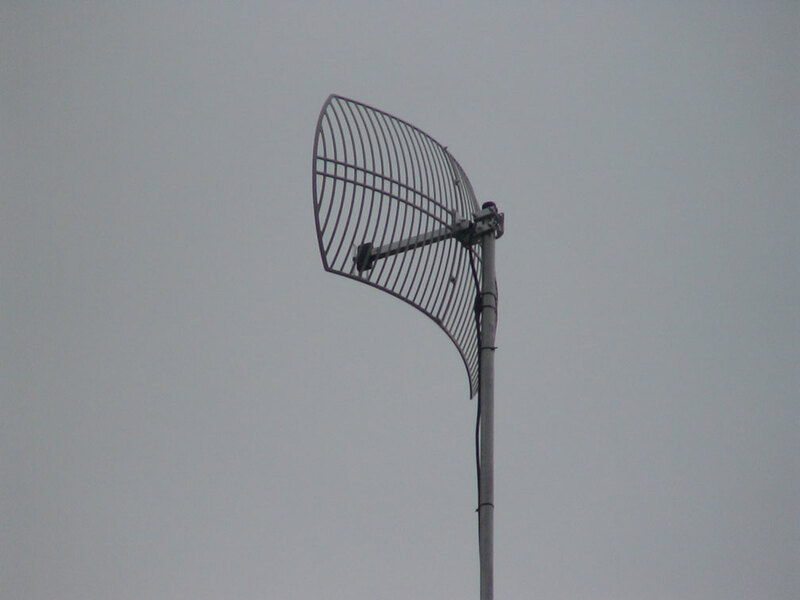 As long as you are near an AT&T cell site, you’ll have Internet access. The only question is, what level of speed will that tower have? And that brings us to my new project. My cell tower offers the EDGE service, which is the middle tier, and I see between 180 to 250 Kbps. 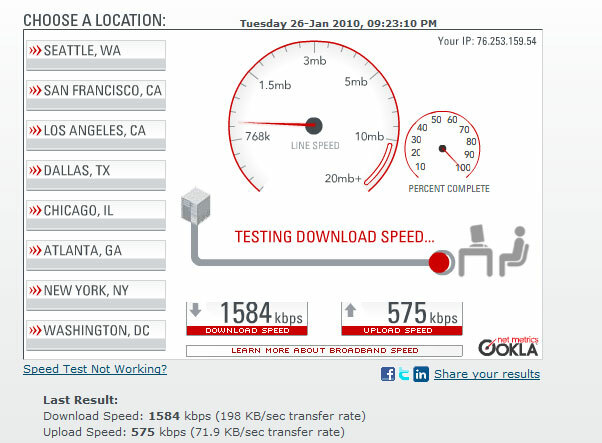 Granted, that’s much improved over the ISDN line, but I’m driven to find the holy grail of Wireless Broadband…3G – which can get me into the neighborhood of DSL to cable Internet speeds. 3G coverage, as the crow flies, is about 22 miles from my house in a small town outside of the nearest metro. So here’s what I’m going to do: I’m going to get that signal. Somehow, someway, I’m going to reel it in from 22 miles away. And I’m going to document the whole experience (succeed or fail) right here.